Both Bill and Isabel Green would love to see more members get involved and volunteer. Otherwise, where else will future Bill Wright Award winners come from? April is an awesome month at OLLI: A new slate of Spring classes and activities begin to blossom. Folks retreat to the beach for a weekend of learning and fun. And, a very well-kept secret finally gets revealed. Bill and Isabel Green remember well that day in April 2009, when they received OLLI’s highest honor at the Annual Meeting of the membership: The Bill Wright Award for Distinguished Service. Perhaps the Greens shouldn’t have been surprised. 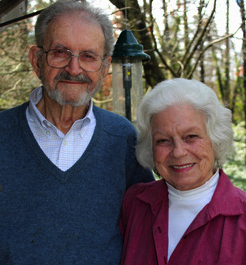 After all, they had devoted more than 15 years of their time and energy to Duke’s Institute of Learning in Retirement (DILR), before it was renamed OLLI. “We had poured a great deal of ourselves into the program and had made great friends. We were proud to receive it.” Indeed, proud and “gratified” the Greens remain. Even now, the Bill Wright Award hangs on a wall of their home. North Carolina is home for both Isabel and Bill. Wake County born and bred, the Greens attended area schools. Isabel studied music and graduated from what was then Peace Junior College. Bill was a fighter pilot in World War II and his University of North Carolina degree in journalism landed him a reporting job at Durham’s afternoon newspaper, The Durham Sun. He went on to become an editor at two other North Carolina papers, before launching distinguished careers in journalism, public relations and the United States Foreign Service. The Greens’ next assignment took them to South Africa. They arrived just as Nelson Mandela was sent to prison. Black South Africans, protesting apartheid his imprisonment, forced the U.S. Embassy to move frequently. After re-assignment to Washington, DC, Bill went to work for NASA. Meanwhile, their family grew to five, all under the age of seven. Isabel had her hands full. A few years later, Bill and Isabel, who left the Triangle with two very young children, were Carolina-bound with three more, who were foreign-born. Back in Durham, Bill served as Vice President of University Relations at Duke for 16 years. Even before he retired V-P Emeritus, Bill says, he would come into contact with participants of Duke’s Institute of Lifelong Learning (DILR). Considering where the Greens had been, Isabel and Bill might have been hard-pressed to find something as interesting as what they had seen and done in the wider world. However, these well-travelled Tarheels were in for a big surprise when they started taking classes at DILR. Isabel calls it “a wonderfully rich experience after retirement. It turned our lives around.“ "Of all the things we’ve done, DILR stands out," says Bill. With their children out of the nest, Bill and Isabel had lots of free time to spend with their peers. And, they donated much of that time to lifelong learning, for themselves...and, for others. Isabel wasn’t too sure she could do it. “I had only worked as a mother of five and a piano teacher of young children,” she says. It’s amazing what a person can do when she tries, as Isabel learned. “To be in charge of 30 adults and seeing we had books, it was a big responsibility. But, the class itself was very participatory.” Clearly, Isabel Green erased any self-doubt. She spent many years at DILR as a class leader. Bill brought his own set of leadership skills to DILR. In addition to serving on the Strategic Planning committee and being a member of the Board, he also served as President for a year. “We had less than half the population, it (OLLI) has now,” Bill notes. He saw an opportunity for growth. One of his other major contributions to the program was the creation of a 15-minute video on DILR’s 25th anniversary. With it, Bill was able to convince the Durham Business Bureau to use it as a promotional tool to show prospective residents. DILR, of course, has since been renamed the Osher LifeLong Learning Institute at Duke. It’s a credit to the Greens’ generous participation in OLLI that it has grown as much as it has. These days, the Greens enjoy their children and grandchildren. When they can, they participate in OLLI activities. Bill attends a men’s discussion group on Saturdays. Sometimes, he attends the Conscious Aging sessions promoted in The Spotlight. Together, Bill and Isabel studied Spanish at OLLI before taking a trip to southern Spain. Their participation in OLLI may have slowed. But, their heartfelt enthusiasm for the program certainly has not.